At the age of twenty-three, postmistress Grace Cristler has all but given up hope of finding a husband among the narrowing group of eligible men in her town of Fairland, Kansas. But when her uncle decides to retire from the pulpit, Grace is responsible for corresponding with the new preacher set to take his place. She can't deny the affection growing in her heart for Reverend Rufus Dille—a man she deeply admires but has only met through his letters. Theophil Garrison is on the run from his past. Ten years ago his outlaw cousins convinced him to take part in a train robbery, but Theo fled the scene, leaving his cousins to face imprisonment. Now they've finished their sentences, but the plan for vengeance has just begun. Branded a coward and running for his life, Theo has a chance encounter that could provide him with the escape he needs. But the young man's desperate con might come at an enormous price for the tenderhearted Grace—and the entire town. Will Grace's undeserved affection and God's mercy make something beautiful from the ashes of Theo's past? 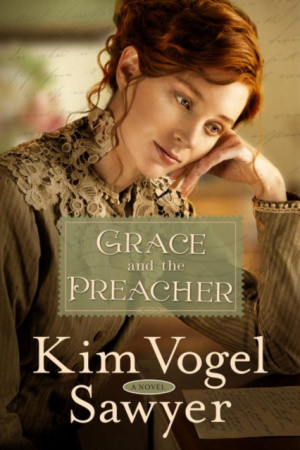 Grace and the Preacher by Kim Vogel Sawyer was published by Waterbrook Press (A Division of Random House Inc) in April 2017 and is our 63975th best seller. The ISBN for Grace and the Preacher is 9780307731418. Be the first to review Grace and the Preacher! Got a question? No problem! Just click here to ask us about Grace and the Preacher.